Students and staff at WZIS-FM, 90.7, are finalists for 11 awards from the Intercollegiate Broadcasting System (IBS), including best faculty advisor and best college radio station on a campus with more than 10,000 students. WZIS has been nominated for Best Radio Station for two consecutive years. "Being named a finalist for Radio Station of the Year in back to back years is pretty amazing," Rich Green, general manager of WISU and WZIS, said. "The passion that the students show for WZIS is paying off. Being recognized as one of the best college radio stations two years in a row is something these students and this station will remember for a long time. "WZIS is nominated for Best Public Affairs Program for their Campus Connection - Community Service. It is also nominated for Best Logo and Best Training Manual. Chris Lopez is nominated for Best Program Director. "We are growing at a fast pace here at WZIS and we have done such a great job in not letting anything get in our way," Lopez, a communication major from Hammond, Ind., said. "We strive to make WZIS the best it can possibly be. We all care so much about WZIS and I am so happy that we can be recognized nationally for these awards because it proves that we are not playing around." WZIS is nominated for Best Sports Interview for their Stephen Holder interview. The radio station is nominated for Best Sports Pre-Game/Post Game Show for their coverage of homecoming. WZIS is also nominated for Best Sports Report. The station is nominated for Best Station Playlist/Music Selection and WZIS-FM Shut-Ins Talk Show is nominated for Best Talk Program. Corey Clark, a communication major from Danville, Ind., who is the student station manager, believes that the station's success comes from the hard work they put in to not only better themselves, but to also help each other. "We all want to be better. We work at our craft everyday, but the biggest reason is that we do this for each other," Clark said. "I have mentioned this every time I get the chance: WZIS is a family, not like a family, but is a family. It never feels like work when we walk through the doors that enter the radio station." This is the second year that WZIS has been a finalist for the IBS awards. Last year, WZIS won Best Use of Twitter, Best News Station Promotion, and Best Sports Pre/Post Game Show. Staff members were nominated for eight other awards. Students and staff are nominated alongside students from all across the country. The winners of the Intercollegiate Broadcasting System Awards will be announced on March 2 during the IBS Conference in New York City. 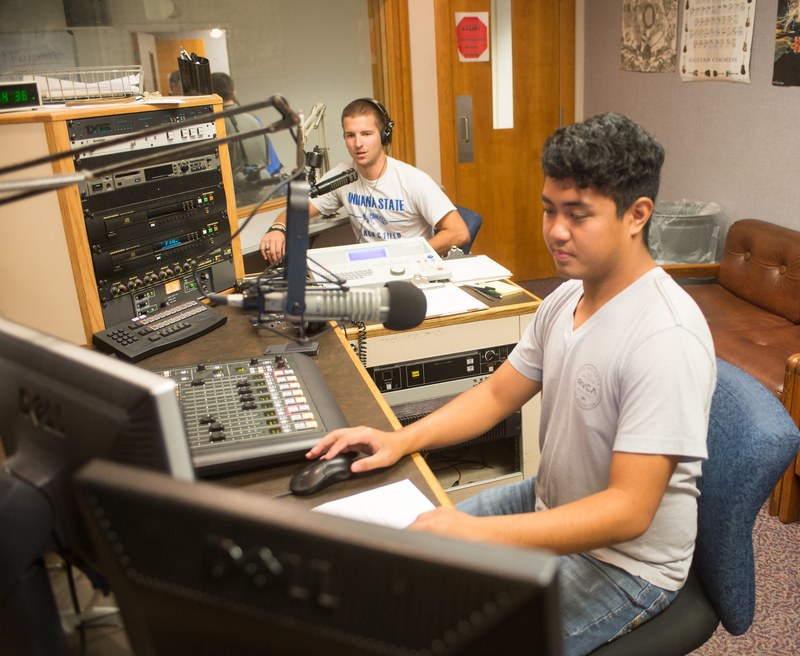 Students and staff at WZIS-FM, 90.7, are finalists for 11 awards from the Intercollegiate Broadcasting System, including best faculty advisor and best college radio station on a campus with more than 10,000 students.